Located at Medini Zone C in Iskandar Puteri, Johor, CI Medini Sdn Bhd is an affiliated company within the Creed Group, a real estate firm from Japan founded in 1996, specialising in principal investment and property development. 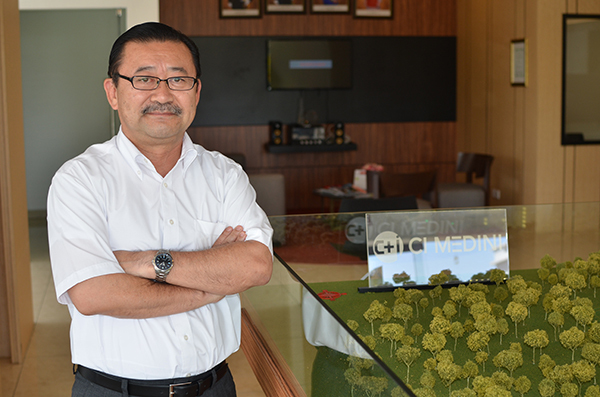 Managing Director Takeshi Matsukata is responsible for the overall management of CI Medini. Matsukata has over 20 years of experience in various aspects of property development ranging from land acquisition, planning, entitlement process, sales and marketing, customer service, finance as well as overall development management in the USA before joining CI Medini in 2015. Matsukata earned a B.A. in Business from Keio University (Tokyo, Japan). Tell us more about CI Medini and what attracted you guys to Iskandar Malaysia? Sunsuria Medini Sdn Bhd started its property development in Medini, Iskandar Puteri, Johor, under Sunsuria Group in 2013. In November 2014, Creed Group joined Sunsuria Medini Sdn Bhd as a joint venture partner. Subsequently, the company name was changed to CI Medini Sdn Bhd in November 2015 when Creed Group became the 100% owner of the company. Creed has invested outside Japan since 2005 and has projects in Cambodia, Vietnam, Myanmar and Bangladesh. We were the first developer to build shop-lots in Medini and the plans we have for our land area encompassing 82 acres in Medini Iskandar Malaysia is for it to become a modern sustainable city of international standing to create a high quality, integrated, uniquely enriching, efficient and secure environment. We were attracted to Medini for its location being close to the Tuas 2nd link and future High-speed Rail (HSR) station as well as various incentives provided by the federal government as a special economic zone as well as the comprehensive master plan for a balanced development as a new city. Khazanah’s role in developing Medini influenced our decision to invest and build commercial real estate in this township. What are the development plans for the 82 acres of land you own in Medini? It will be a mixed development for commercial and service apartments designed to cater to both local and international buyers. The guiding principles of the development blueprint are set to establish CI Medini as the preferred investment destination for international and local retail and institutional investors. CI Medini’s commercial properties are known as The IONS. ION1 (104 units), ION2 (106 units), ION3 (32 units) and ION4 (75 units) consists of both retail shops and offices. This development is strategically located about three minutes’ drive from the Second Link Expressway, theme parks, the Mall of Medini and Educity. We are currently developing multi-level stratified shops with unique walk-in feature from the connected parking structure and are also planning for a service apartment project targeting young families. However, the start date will be determined subject to improvement of the market condition. We are incorporating green building designs in our projects going forward, we are incorporating in our projects. Seamless connectivity between the dynamic and lively commercial precincts and the exclusive urban retreats of the tree-lined residential zones will further enhance our vision of becoming a modern sustainable city of international standing and the overall experience. Uninterrupted views from the iconic residential towers are complemented with inspiring inward-facing views of the landscape canopy and vibrancy of the central “heart”. What are your thoughts on Medini’s progress as a whole? The area is finally taking its shape by completed residential units, offices, restaurants and shops. Construction of the MBIP office is well underway and scheduled to be completed next year as well. I am staying in Medini and it is very comfortable and convenient with necessary services in the area. Roads are wide, well planned and there are no traffic congestions around here. It is a very balanced township, with all the necessary elements to enhance its liveability. This is largely because of the master developer, Medini Iskandar Malaysia Sdn Bhd (MIM). MIM started developing Medini on a clean slate and everything is well planned. Moreover, the Malaysia and Singapore governments are leading the key property projects in this township. Their involvement says a lot about the support given to Medini and is a compelling reason for local and foreign developers to invest in Malaysia. Currently, the property market is sluggish and the outlook seems uncertain. What are your strategies for CI Medini to remain vibrant in slow times? We are watching the market carefully and looking for niches that we can explore. We are also planning to organise more place making events to make the area more vibrant. Medini is already the main destination for business, healthcare, education, industrial and tourism within Iskandar Malaysia and I believe the key de¬velopers of Medini remain committed to the long-term vision of the township and expects demand to pick up once the overall property market recovers. Medini is a work in progress. It is not a finished product, but its outlook is very promising. Once the economic environment improves, more changes will take place. What does Matsukata do when he’s not working? Do you indulge in any hobbies? I try to exercise by climbing stairs and walking. Also, I try to read more books in my spare time. ACCUMULATING WEALTH – From Bear to Bull – what are the lessons?